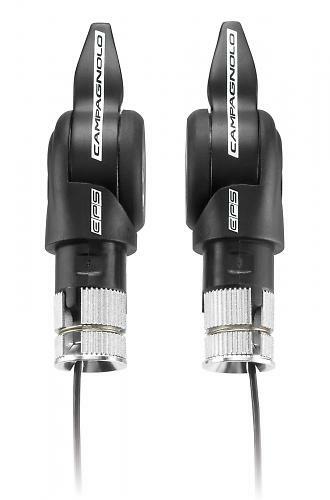 Campagnolo have redesigned their Record EPS electronic bar end shifters for 2013. The new version (above), which is stubbier than before, was on display at the Cycle Show over the weekend. Being electronic rather than mechanical, there’s no reason for the shifters to be any longer than that. 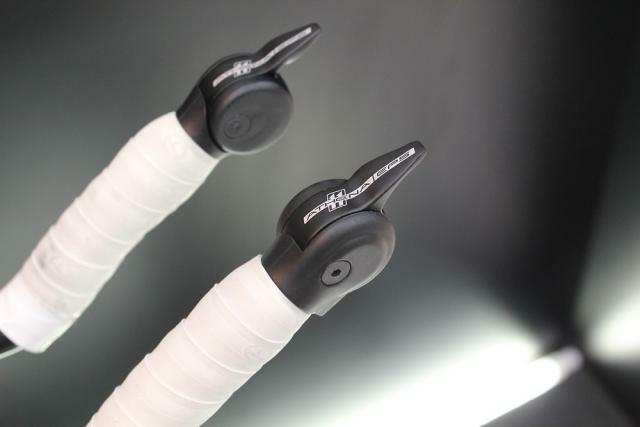 The existing EPS bar end levers have been reinvented for the Athena EPS groupset (below), Campag trickling the technology down to its fourth tier for 2013 - they skipped third tier Chorus. They come with different graphics now, obviously, and different wiring – these will work with Athena mechs only, not Super Record or Record. But, that aside, they look exactly the same to us. We showed you most of the Athena EPS system a while back but we’d not seen the bar end shifters before. Despite being differently shaped, the two versions are virtually the same weight. According to Campag, the new Record ones are 51g while the Athena ones are 52g. On both designs the lever automatically returns to the centre point – or zero position – once you’ve pressed it so it’s always in the same position when you want to change gear. You can set your own zero position. If you want to move multiple sprockets in one go, you just press and hold the lever rather than needing to press it several times.